Zeytinia Gourmet Markets is proud to be dedicated in bringing the Best of the world to your neighborhood as a tradition since 1991. Zeytinia Stores are blend of fresh country market, gourmet shop, small informal eatery, coffee shop and a take out place. ''Zeytinia'' is a deviation of the Turkish word Zeytin, which means olive or olive leaves, the symbol of peace. 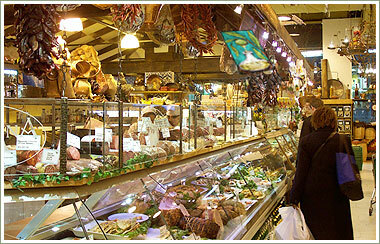 The stores offer a wide variety of olives by the pound, a large selection of olive oil and vinaigrettes, many ethnic foods and cooking ingredients from Italy to Thailand. We also offer a big selection of catering and gift baskets for any occasion.Our gift baskets are suitable for your personal or corporate event and can be designed to fit any budget. We have a mission to constantly improve our menu and to provide bigger variety every time you come to our stores. You can stop by and choose from over 100 different options offered daily. Ready to eat or heat, without the wait or the waiter.